Various newspapers, magazines and news sites have picked up on what would normally be an anniversary to be ashamed of: Belgium has spent the past year effectively without a government. Yes, Yves Leterme’s cabinet resigned exactly one year ago today, bringing about early elections that led to a political stalemate and an inability to form a new government, meaning that Leterme’s caretaker team has stayed on to fill the gap. With the help of decrees from King Albert II, Belgium’s monarch, the experiment in undemocratic government is widely regarded as a success. The unelected rulers even succeeded in sending Belgium’s F15 fighter planes to take part in military strikes alongside the RAF in Libya. The Belgian press have reported that the trains are running better than ever and Belgium’s football team, a rare symbol of national unity, is on track for the European championships. The absence of a government is not particularly serious. Life goes on, the communities and regions [Belgium is a federal state divided into three linguistic communities and three economic and geographical regions] still do their job, the European Union still works. What has ceased to function is a mechanism for reforming the state, which is the current precondition for forming a new government. It’s a very long crisis, but not a very serious or deep one. The Belgian federal model makes it possible for the system to work for a long period of time, even with one of the three levels of government lacking a fully-fledged government. Indeed, Deschouwer goes on to coin a phrase that I particularly like: “Forming a government seems easier to me than terminating Belgium”. And he’s right – because Belgium’s governmental system is so complicated and byzantine that it simply breeds inertia, which means that there has to be a strong state apparatus at all levels to keep the whole thing going in case there’s a blockage somewhere. Those who have lived in Belgium may already be aware of this, but it’s worth pointing out nevertheless: Belgium has six parliaments and six governments (seven, if you count the European Parliament and the other European institutions) for a population of 10-11 million people. Starting with the basics: Belgium is a Kingdom, with a monarch (King Albert II) and a bicameral parliamentary system with proportional representation. That means coalition governments from the get-go, since almost no country with a proportional system (Hungary being the notable exception) currently has a single-party majority government. But it gets more complicated than that. Belgium is divided in two (or, arguably, three) language groups. Almost 60% of Belgians speak Flemish, which is a dialect of Dutch (or, to be more precise, they learn Dutch at school, but speak various local variations of the language amongst themselves, which together can be called Flemish). These people are called the Flemings, and they live in Flanders. 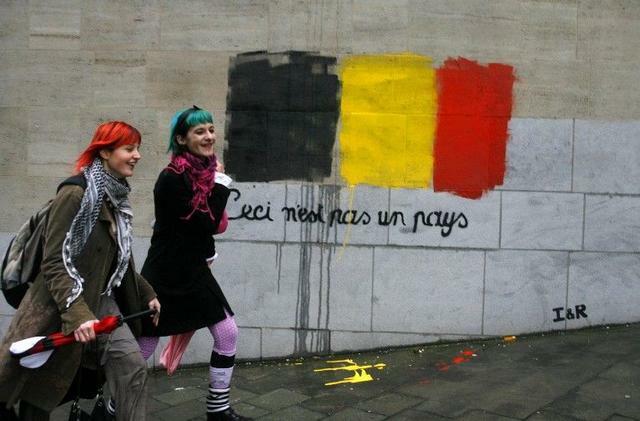 40% of the population speaks French, and lives in Wallonia (the inhabitants of which are called Walloons) and Brussels, the officially bilingual but mainly French-speaking capital of Belgium. Less than one per cent of the population, living mainly in a few towns along the border of Germany, speaks German (these people are known, imaginatively enough, as German-speaking Belgians). First of all, Belgium’s traditionally unitary party system, with three main factions (Christian democrats, liberals and socialists) split along linguistic lines, and fragmented as new parties emerged. That means that what was once a fairly simple three-party system became one with twelve parties represented in the federal parliament (five French-speaking and seven Flemish). For a government to gain legitimacy, it has become commonly accepted that it must command a majority of members of parliament on each side of the linguistic divide. Yves Leterme’s government, for example, brought together five parties (Christian democrats and liberals on the Flemish side; liberals, centrists and socialists on the French-speaking side); following the 2010 elections, it seems likely that any government formed will contain at least seven parties. That makes forming a working coalition that will last a full four-year term extremely difficult. The political system has also split insofar as it moved from a strong unitary state to a fairly complicated federal construction. Without, once again, getting into the history of how it came to pass, Belgium is now a country divided into three regions and three communities, each of which has its own government. The three communities are the majority Dutch-speaking community, the minority French-speaking community, and the tiny German-speaking community. Each of these entities has its own parliament and its own government, handling issues such as education, culture and (to a certain extent) healthcare. But linguistic communities are geographically amorphous identities (the French-speaking community includes Wallonia and Brussels, the latter being a majority-French-speaking enclave in Flanders). As a result, Belgium also created three regions with their own parliaments and governments – Flanders*, Brussels (which belongs to both communities, and is officially bilingual) and Wallonia (which includes the German-speaking community). These regions have wide powers over economic development, infrastructure, housing, agriculture and other similar matters. Confused? I’m not surprised. On top of this, the federal government still has substantial powers in terms of justice, defence, foreign affairs, social welfare, nuclear energy and various state-owned companies (like the railways). So it’s complicated and somewhat kafkaesque. What it all means, though, is that with so many veto points, so many divisions and levels of government, the role of the civil service and administration is essential – and top-level Belgian civil servants are some of the most capable in the world (on top of having to speak a multitude of languages, they must navigate the tough political and cultural landscape on a daily basis). What is more, even as governments change, nothing fundamentally changes in Belgium. The coalition-based political system means that only one or two parties move in and out of any given national or regional government after any given election – and even if a party is in opposition on the federal level, there is a good chance that it will be in government on a regional level, or vice-versa. What that means is that even as Belgium seems unstable on the surface, and slowly drifting apart, with Flemings and French-speakers having less and less in common, it is actually much stronger and more durable than most people think. Which is why, honestly, no-one really cares all that much that the political parties are all acting like petulant children and incapable of forming any kind of coalition a year after the last one collapsed – everyone knows that nothing will really change all that much, and they quite like it that way. *The Flemish region and Flemish community have merged their insitutions – a meaningless piece of trivia, but an explanation of why Belgium has six parliaments instead of seven.